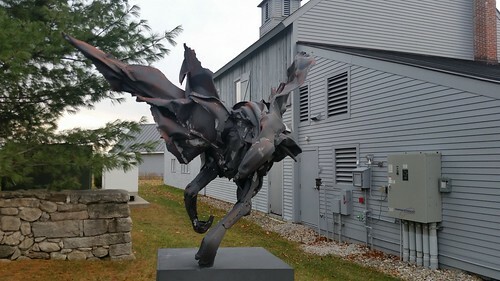 A metal statue in the form of a raven on the Colby-Sawyer campus. I was recently at a conference at Colby-Sawyer and came across this fascinating fellow. I made the assumption that it was Poe's raven, mostly because it say across from a horse statue that had been turned into the Headless Horseman from The Legend of Sleepy Hollow. But it could have been just any given raven that was crafted. This statue was well-crafted with the material in that from some angles, it looked like tissues shifting in the wind (metal tissues, mind you), but then it was also clearly the raven with the beaks, wings, and claws. It was one of those statues that you could circle and look at and find a thousand odd and interesting details.